The Hotel Cortijo Barranco is unique in the area and surrounded by a large and beautiful estate. 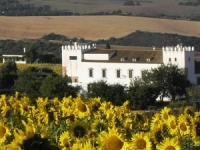 Converted into a large family home, subsequently renovated to provide accommodation in rooms or self-catering casitas.€¨We are in Arcos de la Frontera, declared Artistic Monument in all its beautiful set and the best starting point for the Ruta de los Pueblos Blancos of the Sierra de C;¡diz.€¨A short distance away the Natural Parks of Grazalema and the Alcornocales, the beaches of Tarifa and the Bay of C;¡diz, Jerez de la Frontera, Vejer, Sevilla, Ronda and M;¡laga. Located in the center of the farm, of agricultural activity,its land surrounds, isolates and offers you a vision of its organic olive groves and rolling hills of wheat or sunflowers with the unrivaled mountainous horizon of the Sierra de Grazalema.